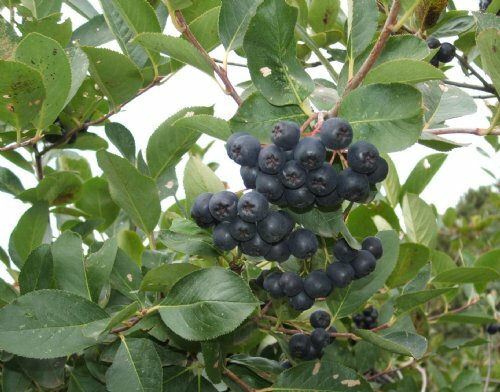 CHOKEBERRY, BLACK - A medium sized, multi-stemmed, shrub reaching 5 to 8 feet in height on favorable sites. 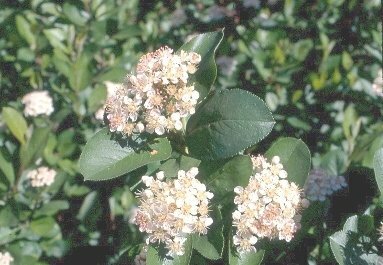 Foliage is a shiny green turning wine red in the fall, white flower clusters are followed by persistent, astringent fruits dark purple black in color. Tolerates low, wet areas though is adaptable to varying soil conditions. Native to the northeastern, eastern and mid-western U.S. Useful fruit for wine making. The 'McKenzie' seed source is a superior seed strain from the Bismarck NRCS Plant Materials Center. Self pollinator.